Why Isn’t SF Painting the Streets Red Like New York Is? 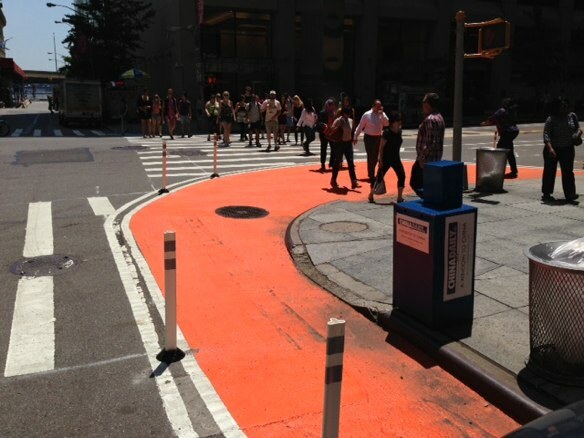 In New York City, it's apparently easy to stumble across new expansions of public space using low-cost, temporary measures. Why not in SF? Photos: Clarence Eckerson Jr.
Just after our look at the faltering pace of plaza expansions under San Francisco’s Pavement to Parks program last week, we get another glimpse of New York City’s ongoing efforts to reclaim street space for people and improve safety using low-cost, temporary measures like posts and gravel epoxy. Apparently, these kind of space re-allocations happen so frequently, our Streetfilms manager Clarence just stumbles across them while making his way around Manhattan. After hearing a speech from NYC Department of Transportation Commissioner Jannette Sadik-Khan at the SF Bicycle Coalition’s Golden Wheel Awards last week, I asked SFMTA Director Ed Reiskin why the city isn’t reclaiming space for pedestrians at the pace New York is. He pointed to the agency’s efforts to reclaim road space for protected bike lanes, and said he’s “not sure that there are that many great candidates” for other public space expansions. 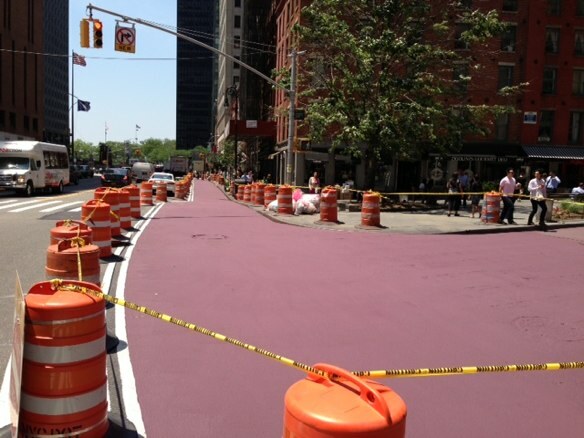 It only takes a quick peek at Streetsblog New York, however, to cast some serious doubt on that claim. Actually, this one is interesting because it does NOT fit in with everything else theyve done. I’d wager the contractor made a mistake here. Its important that colors be consistent. Colors mean no cars, that’s consistent and most important. No, because you have to consider the rules for bikes as well, especially in places where bikes arent allowed on the sidewalk. In some NYC plazas, a green bike lane runs among the beige. There you go – spilling the beans about the quick changes in NYC – what will Dorothy say? NYC, snarky comments aside, is not SF. It does not have our open space, or wilderness areas,and we don’t have their pressure. They have far more need for urban open space than we do and we don’t have to copy everything they do. As someone who lives and works downtown, public spaces and pedestrian spaces are definitely needed. The point is also to calm traffic and facilitate walking. These are things that all American cities need, regardless of existing green space or wilderness areas. I can’t exactly walk to the presidio on my lunch break, but it would be nice to have more street space to walk to the nearest public plaza. Likewise, many of south of Market’s and the tenderloin’s residents may lack the means to access greenspace on the edge of the city or outside SF entirely. Creating better public spaces in our neighborhoods and connections to transit and parks is a goal of the city that is taking a long time to develop, so piloting/experimenting with low-cost improvements would be a great thing to do and as New York has shown, it mostly takes political will.